What are the types of share trading orders? What is an IPO in the share market? We often come across terms like shares, stock market and phrases like ‘the stock market is up and ‘investment in stocks’. But how many of us know what these really mean? Sure, you’re likely to be bombarded with these terms if you turn on a business channel, but many continue to have either little or no certain knowledge about them. Or even worse, sometimes it’s false and misleading information. Our schools and colleges don’t teach us about investment and financial planning. But this is what really matters once you’re out there in the dog-eat-dog world. A company’s capital is divided into shares in order to sustain, grow, expand or raise funds. This means that people buy shares with the expectation that the value of the business and so its shares would rise. Shares can be classified into Equity and Preference shares. These differ in terms of power given to shareholders. 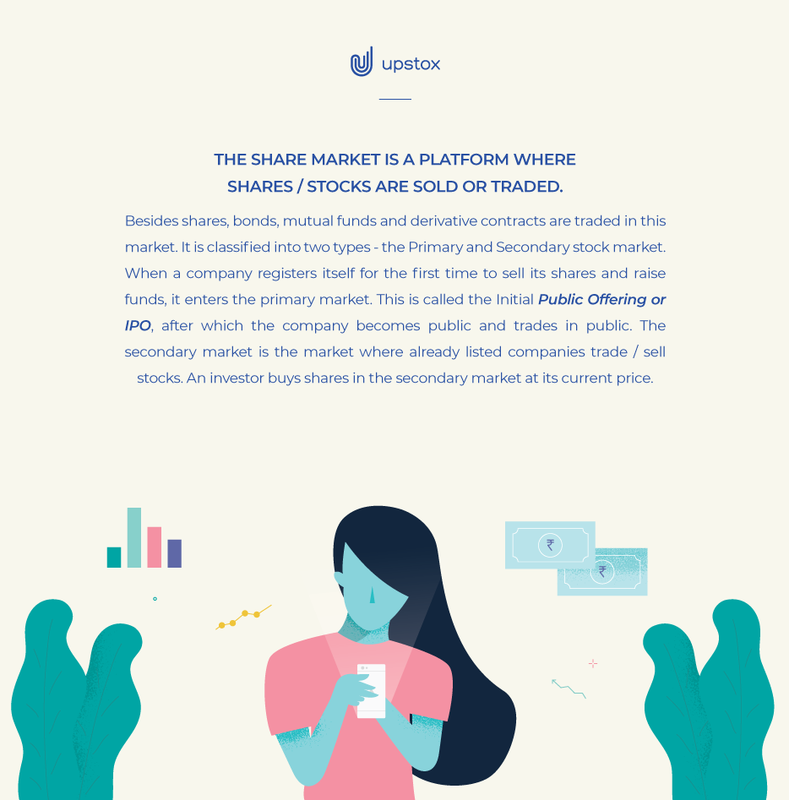 But fear not, here are some old school basics about shares we’re happy to share (pun unintended). A company’s capital is divided into shares in order to sustain, grow, expand or raise funds. Each share forms a unit of ownership of a company and is offered for sale to people who look to invest in order to raise capital for the company. Now why would anyone buy shares of a company? Well the obvious reason is: to receive capital gains in the future. This means that people buy shares with the expectation that the value of the business and so its shares would rise. Capital gains can either be achieved through capital investment or through dividends. Equity shares give the shareholders the power to share the profit in the company as well as a vote in the Annual General Meetings’ of the company. Such a holder has to share the profits of the company or inversely bear any losses incurred by the company. Preference shares only gives a fixed amount – dividends, from the earnings of the company and usually gives no voting power to holders. There are several ambiguities to the terms shares, stocks and equities and what they do. There isn’t much difference between these terms other than the context in which it is used. When someone says “stocks” it is to denote the ownership certificate of any company in general and if they say “share” it denotes the same to a particular company. Equity, on the other hand, refers to the stock/shares held in a company in its various forms like private equity and so on. What is a Share Market? The share market is a platform where shares/stocks are sold or traded. However it’s not just shares, but even bonds, mutual funds and derivative contracts that are traded in this market. Again, it is classified into two types – the Primary and Secondary stock market. When a company registers itself for the first time to sell its shares and raise funds, it enters the primary market. This is called the Initial Public Offering or IPO, after which the company becomes public and trades in public. The secondary market is the market where already listed companies trade/sell stocks. An investor buys shares in the secondary market at its current price. It also offers the investor an opportunity to sell all its shares and exit the market. Learn more about Primary and Secondary Stock Market. India may be not be the best competition when it comes to global investment opportunities and market caps, however the potential that it presents in terms of growth is vast. Investing in the Indian Stock Market[#76 – Share Market Investment Tips] is not such a bad idea provided you play it smart. The two most basic terms one needs to familiarise with in the Indian stock market are the BSE and NSE. Trading in the stock market takes place in two stock exchanges – the Bombay Stock Exchange (BSE) and the National Stock Exchange (NSE). Both are rivals in the stock exchange market, however they have the same process and trading mechanisms. Almost all the significant firms of India are listed on both the exchanges. NSE has a dominant share in spot trading and is almost a total monopoly player in derivatives trading. MCX (Multi Commodity Exchange of India Ltd.) and NCDEX (National Commodity & Derivatives Exchange) are two of India’s commodities’ exchanges. To many people, the stock market sounds like a scary, complicated entity that cannot be understood. But here’s some basic knowledge that might change that perception. Companies list themselves either in the primary or secondary market to raise funds or capital. The company has to give details about its business, financial status and the stocks being issued (IPO). Once listed, the stocks issued can be traded by the investors in the secondary market. This is where most of the trading happens. In this market, buyers and sellers gather to conduct transactions to make profits or cut losses. However there are thousands of investors, and in order to extend its coverage we have stock brokers who act as intermediaries. They send the order to the exchange. The exchange finds a seller, after which the confirmation is sent back to the broker and the broker finally debits/credits your accounts. Broker sends the order details to the exchange. The exchange looks for the seller to confirm. The exchange confirms the order to the broker. Trading happens – money is exchanged. This almost seems like placing an order in Flipkart and Myntra. Well, that’s the basic process for you. The stock market might seem like a complicated avenue at first. However, it is necessary to know what it is and how it works, as all of us have a common goal of successful financial planning. Investing in the share market might seem less of a risk when you understand what it is all about. A company’s capital is divided into shares and these shares are sold or traded to raise funds or grow. There are Equity and Preference shares. Equity shares give the holder voting power and the holder has to share the profit of the company. Preference shares usually give no voting power but provides fixed amount from profits-dividends. Share Market is the market where shares/stocks are traded, bought or sold. When a company registers itself for the first time to sell shares (called IPO), it trades in the Primary market. Secondary market is where companies that are already listed involve in trading stocks. The trading in the stock market in India takes place in two stock exchanges- the Bombay Stock Exchange (BSE) and the National Stock Exchange (NSE). Share prices change as they are dependent on the perceived value of one unit of a company. If the demand of the stock rises, the buy order will increase and so does the price.